Yesterday, Google finally announced its very long rumored Google Drive, basically a big pile of cloud storage. If you have a Gmail account, you can get 5GB of storage for free, which you can sync across devices, computers and the web. Pretty much like Dropbox. Except Google-ified. I’ve been a faithful Dropbox user for a few years now, and it really has become an indispensible part of my workflow. All my things are synced and working on files from home or the office is brain-dead simple. Thanks to Dropbox referrals, I’m currently rocking 20GB of free storage, and depending on what project I’m working on, I am using only a little or a pretty decent part of that allotment. Enter Google Drive. I applied for my account yesteday afternoon and come late evening, I had an email saying it was ready for me. I downloaded the Mac app, which looks and behaves just like Dropbox’s app. After syncing up with the mothership, it downloaded everything that was in my Google Docs folder. Which is OK, I guess, though I didn’t really need it. I use those in Google Docs. 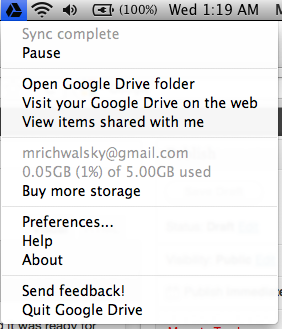 That basic functionality is missing, at least right off the bat, in Google Drive. There’s no public folder. To make a document shareable, I have to go to the browser-based version of Drive and select sharing, and much like Google Docs, I can pick people who can see my document or open it up to the whole world. I wish it was a little easier. My other thoughts were about pricing. With Dropbox, new users get 2GB for free. With Google Drive, users get 5GB for free. Obviously, 5 > 2. But I’ve referred enough people that I’ve got 20GB from Dropbox. 20 > 5. But, Google allows people to buy more space. Isn’t that nice of them. For $2.49 a month, I can get 25GB of storage, and as a bonus, I’ll get 25GB in Gmail as well. That’s a pretty interesting price point. What really caught my eye was for $4.99 a month, I could get 100GB of storage and syncing. That’s a crazy prize. 100GB at Dropbox will run you $19.99 a month. It will be interesting to see if Dropbox lowers their prices in response. The thing here to remember is that Google has the biggest storage and data network in the world. Dropbox uses Amazon’s S3 service, so there is fixed costs it has when it comes to storage. That 100GB of storage from Amazon will run the average person $10, but at how much data they store, I’m sure they get a huge price break. Still – $4.99. Wow. Both Google and Dropbox have had their share of privacy issues recently, and may people are freaked out with Google having access to all kinds of data now that they can use to index and ultimately sell ads against. This tweet from Merlin Mann was interesting. That’s kind of scary. Dropbox’s terms are a bit less scary (H/T Jesse Lavery.) Are you willing to trade your info for the convienence of having your files anywhere and everywhere? Something to think about. TL/DR; Google has free cloud storage, you can pay for more, privacy is something to pay attention to.